Who Will Win the Self-Driving Race? di Tech@B 21 Febbraio 2017 8 min. Driving accidents claim the lives of some 1 000 000 people yearly, and inflict pain on countless relatives and friends. Human error plays a role in 90% of cases. The goal of self-driving cars is not to become perfect drivers, just better than humans. People can be amazing at driving – given that we ride in high velocity metal cans in close proximity we still rarely see accidents. Yet accidents inevitably happen and self-driving cars want to take the inevitability out of that equation. The vision of a fully automated transportation system evokes strong emotions – wonder for futurists and fear for car enthusiasts and professional drivers. The technology is ready and improving due to advances in machine learning and falling prices of key components. Yet the regulatory and ethical questions being raised have made bureaucrats anxious and philosophers relevant. Without delving into the benefits and risks, I’ll introduce a layman’s version of the technology and analyze which companies are optimally positioned to deliver the best self-driving car. The players are carmakers of the likes of Daimler and Toyota, software specialists such as Google, and one that is both – Tesla. The concept of Machine learning is not complicated to understand. Let’s differentiate between regular programs and programs generated by machine learning. In both cases, the program is a set of instructions to reach a certain goal. However, for normal programs the instructions are written by a programmer, but for machine generated programs, an algorithm produces the instructions by finding patterns in data. Give plentiful, structured data to the algorithm and it will find patterns that lead to the desired outcome and generate and refine the set of instructions to deliver on the objective. Even though machine learning algorithms get the press, their value is a function of the amount of data available to them. For instance, Google openly publishes a lot of their algorithm advances. Is this a reflection of their “don’t be evil” motto? Not necessarily. If you have no data from which the algorithm can find patterns and learn, the most sophisticated algorithm will be useless. With Google and few others like Facebook and Amazon holding enviable amounts of data, it’s in their benefit to share research. Without the data, no one can attack their position. However, if someone takes their results and publishes an improvement, this can result in massive value generation when applied to their vast databases. Self-driving functionality is dependent on the interaction of three components – maps, location system and a decision-making system. Maps allow the car to identify routes and location systems with proximity sensors, radar and lidar generate a 3d model of the environment with the position of other cars, bikers, pedestrians. Finally, the decision making system calculates the optimal route and most importantly processes the real time data generated by the location system and makes real time decisions regarding turning, speeding, stopping, and every other action of driving. It is exactly in this system where the machine learning algorithms plug in. Basically, data from driving is generated as someone is driving. The algorithms are run on this data. After being fed many terabytes of data the algorithm finds patterns, such that it can form predictions and make correct decisions the next time similar data is confronted – what to do when the car is in a similar situation. The higher the quantity of data and the higher the quality of the data (more advanced sensors), the greater the ability to capture situations in greater nuance and the better the patterns and the overall ability of the self-driving program. The value is in the data. There is a real self-driving race going on. The best self-driving technologies will be distinguished by the decision making system. Those systems depend on the amount of data available for them to learn from. 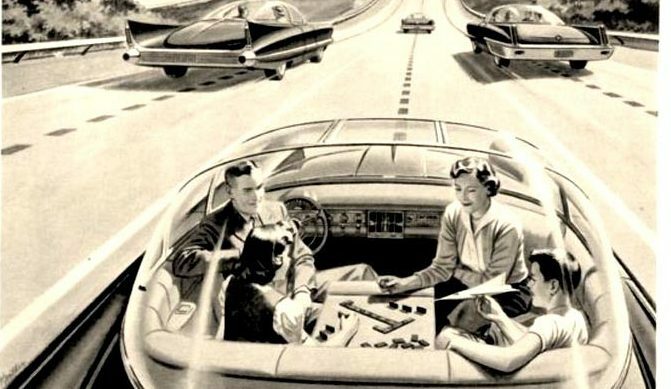 Let’s suppose in the near future there are cars with some self-driving features like driving on the highway, but humans will be still driving them the rest of the time. Now it’s not difficult to imagine having the sensors record environment data and the car recording driver data, that can be compressed and sent over mobile or Wi-Fi connections to the cloud, where the algorithms can be deployed to learn from this data, improving self-driving for all other cars as they update to the newest firmware. So if self-driving becomes a key feature in future cars, it’s not hard to imagine a positive feedback loop where the best self-driving cars are bought by the largest number of consumers, which in turn generate more data and make the technology even better. This is why there is a race, as the first to deliver great technology will be able to develop an advantage. Generally, carmakers lack the technology and software makers lack car-production capabilities. Google and its spun-off self-driving car project now called Waymo have probably the best technology in terms of decision making, and have scaled down their ambition from producing both cars and the self-driving system to only the latter. The data is generate by having human drivers drive in several modified Lexus RX450hs and their own prototype cars. In addition Waymo deploy the algorithms to learn in simulators. The same is done by Uber with people driving their modified Volvo XC90s and Ford Fusions in cities around the US. The enlightened old-school carmakers are moving fast develop the technology in-house and establish partnerships with tech companies and component suppliers. These include almost all major players among which Toyota, BMW, Daimler, Ford, Volvo, Nissan, Renault, and others. They all have dedicated resources and set varyingly ambitious project goals ranging from driver assistance, semi-autonomous (highway) and fully autonomous capability. In the game are also tech firms, with Baidu, Intel, Microsoft, Nvidia moving to develop software or hardware. As time-to-market is curcial, Tesla is a company well positioned to deliver great self-driving technology. Having both the software and hardware and car (relatively) in-house, Tesla can move faster to execute. Tesla claims that its newest and most mass market car to date, the model 3 will have full self-driving capability. No matter how many cars Google and Uber modify with countless hours of human driving, they will never generate the amount of data as the hundreds of thousands future drivers of the model 3. On the other hand big manufacturers can match and exceed these numbers, but will customers trust these car brands with self-driving tech and pay up for the feature? If the rollout of the Tesla Model 3 is a success, imagine a large fleet of vehicles driving throughout the world, with every mile making the decision-making system marginally better. The system would even have location-specific data, or data on what the average driver did on this exact street with these similar conditions sometime in the past. I am excited to see the technology progressing and self-driving systems being getting tested in more towns and cities around the world. A new age of safer, optimized and cheaper transportation is upon our society. Yet for companies seeking to drive the change – it’s the data that counts.